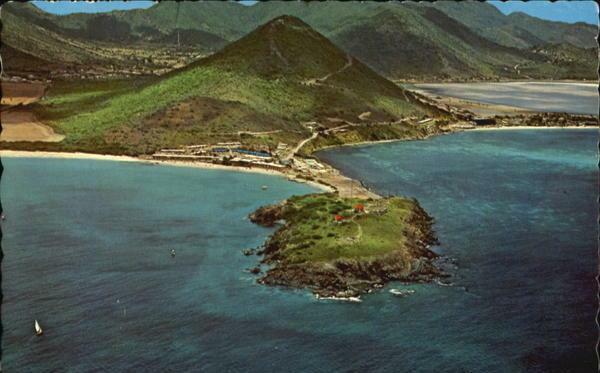 Aerial view of the peninsula with Fort Amsterdam where the radio-station was located. I am a hoarder of paper of all kinds. Regrettably though in my moving from place to place as a revolutionary and young bachelor I lost many documents which is a source of much regret today. Thankfully, there are some things which still survive however. One of the files I have goes back to 1966 when I replaced my colleague Sydney Lejuez as the local reporter on the Voice of St. Martin. Sydney had gone on one of those long vacations we used to enjoy as civil servants back then and so I was asked by the Rev. Brother Bob Mayer to take Sydney’s place. Somehow I kept nearly all of the news broadcasts which I did between 1966 and 1968 and I have them in their own file. There is a lot of historical information in that file, but I want to only give my own experiences with the station in this article. In going over the file turns out that I was paid fls.25.—per month to collect and broadcast the local news. Out of this I paid Mr. Alcile Lake who worked at the Philipsburg Utilities Store, fls.15.—per month to pick me up at Captain Hodge’s Guesthouse and then to drop me off after the news was over. So obviously I was not doing this for the money. When Alcile could not make it, Brother Mayer would pick me up. I remember once he picked me up at the Pasangrahan Hotel. I came into the car with my unfinished beer in my hand. He protested and said he could not allow me in the car with a bottle of beer. So I waited until I had finished the beer and got in the car and we took off for Fort Amsterdam where the radio station was located. 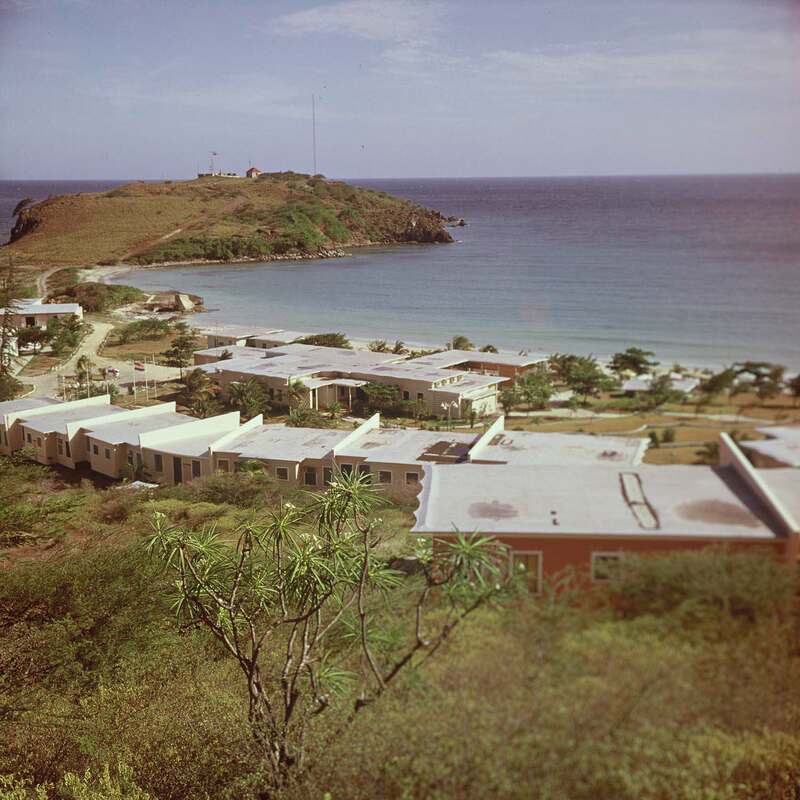 Little Bay Hotel with in the distance Fort Amsterdam where the radio station was located and where I gave out the local news between 1966 and 1969. There were times also when I would walk to the station and back to town via a stop at the Little Bay Hotel and meet friends there for a drink. It would be easy for me to pretend now that it was as easy as a piece of cake. For me it was a nerve racking experience. Never having been on radio before and thinking on who all were listening out there was a big problem for me. However after a few broadcasts I acquired my own little fan club. After each broadcast a Mr. Reed from Mt. William Hill would be the first on the phone to tell me:”Mr. Johnson, wonderful job tonight, you are the best etc.etc.” I remember Mr. Reed always with a long cigar. I don’t even think he smoked it. More for effect than anything else. This was before local television. Mr. Reed had brought a television and outdoor antenna from Aruba and found out that he could get a couple of television stations in Puerto Rico from his location. He transformed his living room into a sort of television viewing theater. If you wanted to watch television you could pay one guilder and spend a couple of hours watching Spanish language television. Not much Spanish on St. Martin back then but Mr. Reed did get his customers as television was a great novelty back then. With my broadcasts I got a head start for my later political career. I was the first Saba person at the time (1966) to be broadcasting on a radio station and people on Saba were pleased and proud to hear my voice. In this article I will share with my readers some of the comments I got from family members and the reaction of others to my first broadcast. 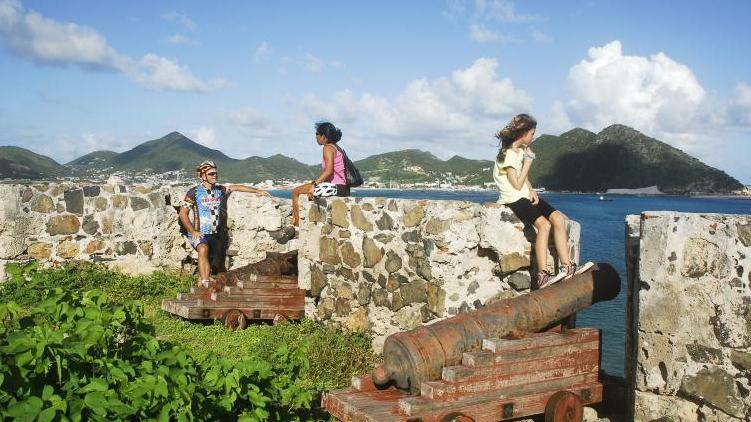 Visitors to the old Fort overlooking the Great Bay harbour. But first some more interesting things which I remember from those days. One late afternoon while I was walking up to the station I noticed a mass of dark clouds coming in from the direction of St. Barth’s. As I came into the station Brother Mayer was giving out the weather report. This consisted of looking out the window in the opposite direction from where the weather was coming. He predicted that the islands were in for a prolonged period of good weather. The local news and the weather report were requirements for him to maintain his license. By the time I was finished with the news the storm cell which I had seen coming up to the Fort was already dumping loads of water on the island. I will not tell you that St. Martin has not had more major rain events than that night. But believe me that night’s rain and the resulting flooding can be counted among the major rain events which the island experienced outside of the hurricane season. So much for Brother Mayer’s weather reporting. After the news a friend called me and thanks to her picking me up at the station I was able to get back to town that night. I remember fondly Brother Rogers from St. Kitts who did part of the religious programming. He worked for Brother Charles Vlaun of F.W. Vlaun & Sons who sponsored the radio station and all of Brother Mayer’s church activities on St. Maarten. One night when I was reading off the news I happened to look up and in the next studio through the glass I saw Brother Rogers buckled up with the laugh. Realizing that I had to mention that name at least twice again in the broadcast I got real nervous. The headline was that the ALM had acquired two FOKKER airplanes. Who tell the man with that name to give the name to his planes as well? His name was already messed up for English speaking people as it was. 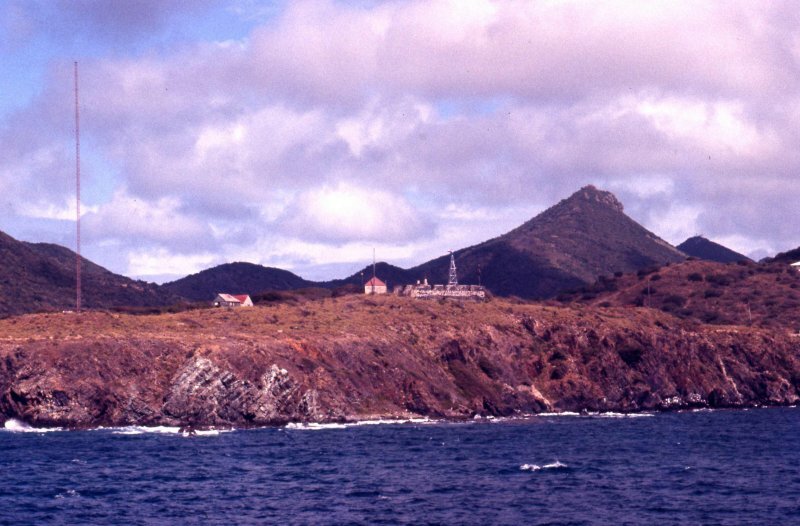 A view from the sea of the Fort and the radio station with the antenna to the left. I was the Local News reporter there from 1966 to the end of 1968. The next day when my friend Lorenzo de Lain was passing down the alley by the Courthouse he poked his head in the Post Office where I worked and shouted out to me:” Will, when are those two FOKKERS coming again?” So you can see why poor Brother Rogers had a problem dealing with my broadcast that night. Sometimes I would even get in trouble with the politics as well. I remember one night on my way to the station I stopped at the Seaview Hotel bar to fire one with Claude and Clem. They gave me a news item which I should have avoided. They were at war with then Commissioner Charles Vlaun and let me know that they intended to bring in a new Commissioner. I worded it in such a way that it was not specifically directed against Mr. Vlaun, however he knew what was going down. After the broadcast he called me and told me the story and in a nice way suggested that not to let anyone use me. Let them come out with their own press releases. And I took his advice after that. In that old file I found things which I don’t even remember. A resolution from August 12th, 1968 changing the resolution on hurricane preparedness article 11 whereby the Head Command Post was put under the responsibility of the Lt. Governor, and the Head of the Department of Public works A.C.Wathey (who though Senator had to have a job). Senators back then got a stipend of f.75 guilders a month and in 1986 I used to get f.750.—a month. The other members of the Head Command Post were Johnny Siegers, William S. Johnson, Joe Richardson, and John Vlaun. That position must not have lasted very long as soon after that I was at war with the establishment and was thrown off every committee I was on. Of course a mother would say those things. The next letter is from my brother Freddie, teacher, oldest brother and lecturer to me as to how things should be done. Letter dated September 9th, 1966. 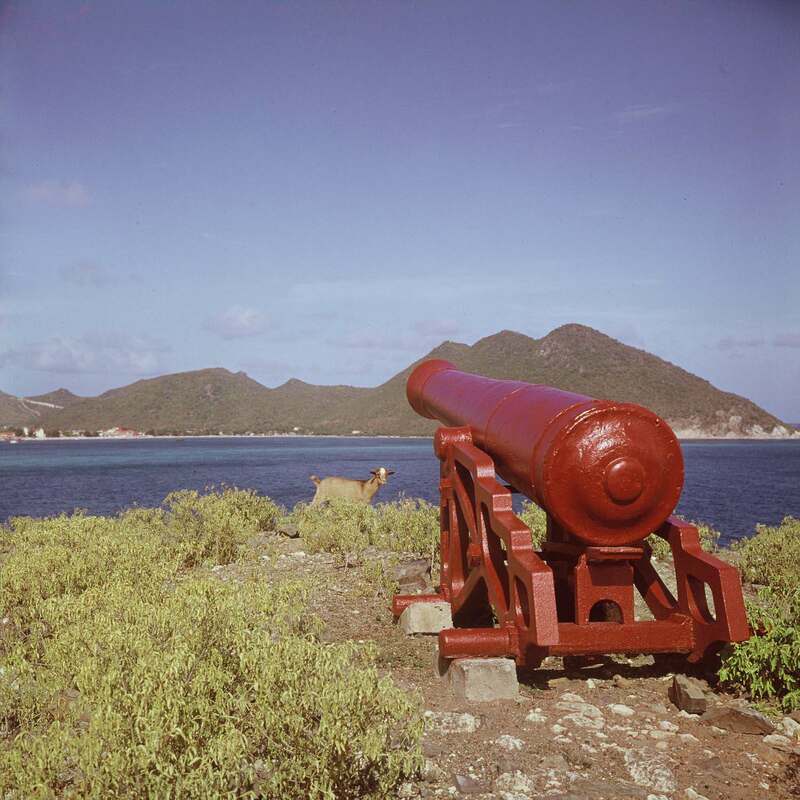 From Fort Amsterdam where the radio station was located looking towards the town of Philipsburg. We listened to your Local News Cast on Tuesday night, it was very good, but try and not do like Uncle Sid and give out news that’s 2 weeks old. You should slow down a bit. Evered (Jackson) got on something about it. He says when he heard you start talking he demanded for Carlos (his grandson) to keep his mouth shut. Maybe this is something for your local news cast, namely the changing of the school system in Saba. Maybe you already know about it. All the children from the 4 villages go to the First grade in the Windward Side, also 3rd + 6th grade are in the Windward Side. 2nd, 4th, 5th and 7th grade are in the Bottom, in this there is a teacher for every grade, where formerly a teacher had to contend with 2 classes. The Government pays for transportation from the different villages. And Spanish and French are taught in the highest grade. Listened to the local news tonight and it was very good. I hear the Dornier will be on the run the first week in October. My Brother Freddie’s main concerns were the schools and the airline as you can see. My brother Eric wrote on September 17th, 1966: “I didn’t listen to you last night. I had to go to the Bay for the mail. Guy has 2 weeks off and Kenneth is sick. 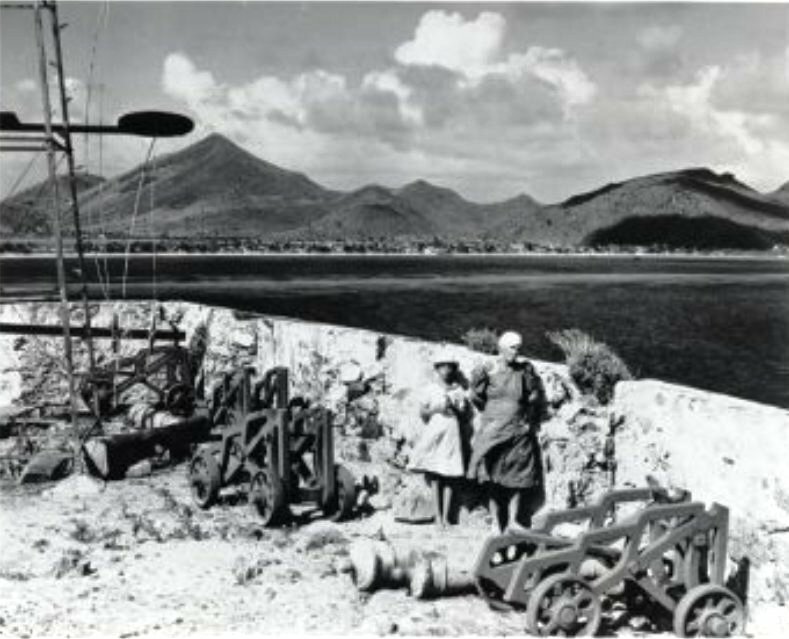 There was also a lighthouse in the Fort which Mrs. De Weever and her husband used to take care of. Also a signal station for the boats entering the harbor. When you spoke Wednesday night some of the rummies that hang around Carl (Hassell) was listening to you and when you was finished, Mr. Carl told them:” Dog gone it, have a drink on the heads of that boy.” Some of the critics here or jealous people have some remarks to pass. I hear the Dornier will soon be on the run again and they expect the Twin Otter in December. Carlton (Riley) told me you was here on the speed boat. I was going to go to the Bay but after I didn’t see her anywhere coming I went to my sleep. “And then he goes on with several articles which I can use for the local news cast. And the more things change the more they remain the same. Here is a news item from around the same time: Theft at Oranje Café. On Sunday the Police Department was busy investigating a theft which took place at the Oranje Café in Philipsburg. According to reports a window at the back of the building was broken and the person or persons involved in the theft, entered through the window and got away with quite a sum of money. 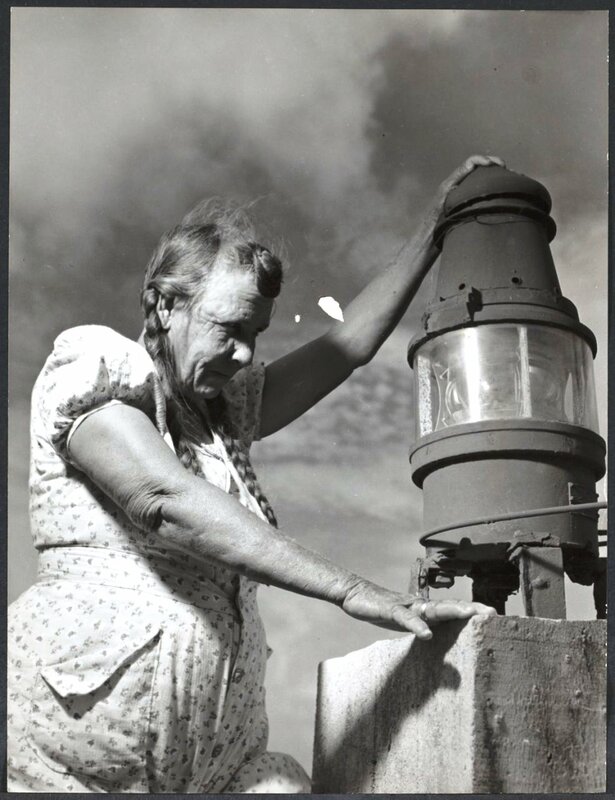 Mrs. de Weever checking on the light of the Fort. She and her husband and children took care of this for many years. These many years later when reading with incomprehension why there would be people who would be jealous or envious of such a thing as me giving out the news I am amazed. However now that I use Facebook as my personal newspaper and I read posts with comments against my son and I who work hard with only the general interest of the island and its people in mind, I realize that there are really envious and jealous people out there even if you do not have ill feelings towards them. I am just posting this so that the reader can see the letterhead of Brother Robert Mayer.